Capricornus. © 2003 Torsten Bronger. 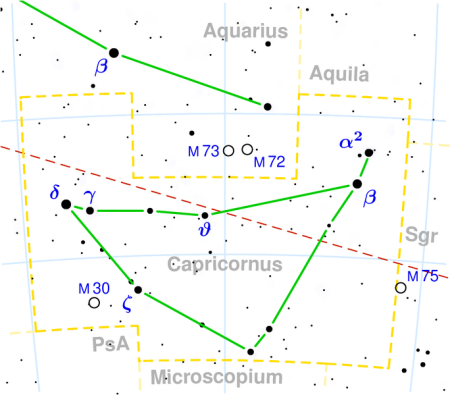 Capricornus (abbreviation: Cap), the Sea Goat is an extensive but dull southern constellation and the tenth sign of the zodiac. It lies to the north of Microscopium and Pisces Austrinus, to the west and south of Aquarius, and to the southeast of Aquila. In ancient times the Sun was in Capricorn at the winter solstice but, because of precession, is now in neighboring Sagittarius at this time of the year. The latitude on Earth on which Capricorn appears overhead of an observer is still known as the Tropic of Capricorn. Among the constellation's deep-sky objects are the globular cluster M30, which is easily seen with a small telescope but difficult to resolve into individual stars, and the Capricornus Dwarf. See below for details of the constellation's brightest stars. 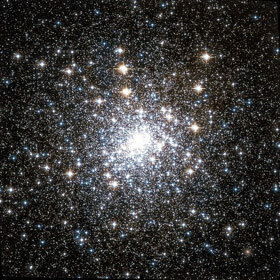 M30 (NGC 7099) is a globular cluster (magnitude 7.7; diameter 11 arc-minutes; distance R.A. 21h 40.4m, Dec. 23° 11'), which lies about 27,100 light-years from Earth. It is about 93 light-years across and has a total mass about 160,000 times that of the Sun. It has undergone a process known as core collapse so that it central density of about a million solar masses per cubic parsec – one of the highest concentrations of stars in our galaxy. M30 moves through ihe inner galactic halo in a retrograde orbit around the Milky Way suggesting that it came originally from a satellite galaxy.